Benjamin Sears shares his favorite yoga practices and how yoga has changed his life. 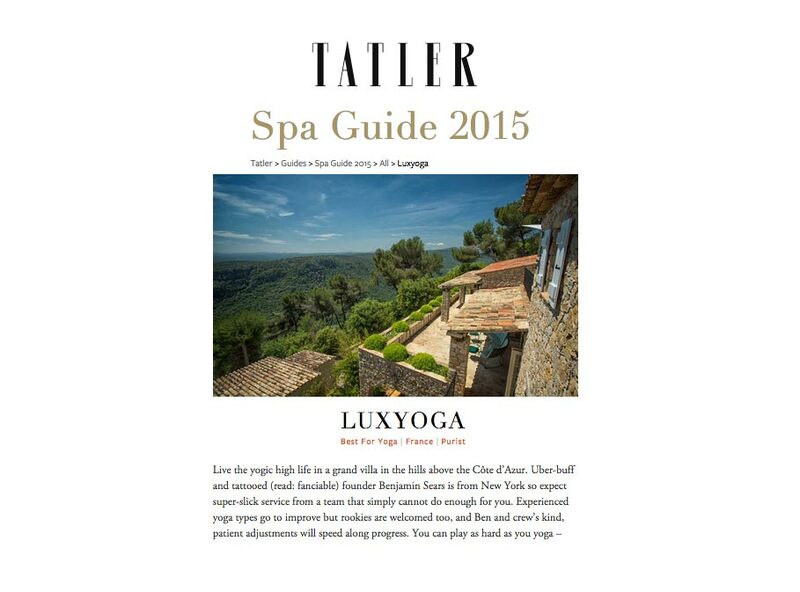 Plus, get an inside look at LUXYOGA retreats in the South of France, and more. Read on for Benjamin Sears featured in titles including Yoga Journal, The New York Times, and Vogue. Benjamin Sears of LUXYOGA shares how he found yoga, and continues to discover and rediscover his body and mind through the practice. We sat down with Benjamin and asked him a few questions about his practice, and how he gets rid of negative self talk. If your yoga practice is putting pressure on your knees, we hear you. Follow along with Benjamin Sears, as he teaches simple, yet powerful exercises for a couple common issues around knees: lack of internal rotation, and weak or tight hamstrings. In addition, he addresses the importance of protecting your knees in standing Warrior postures. If stress keeps thwarting your best efforts to maintain a healthy lifestyle, you need a retreat that focuses on inner peace as well as physical improvement. LUXYOGA hosts getaways featuring Vinyasa, Hot Yoga, and Bikram practices in a quaint villa in the South of France. Ever experience shoulder pain in your yoga practice? Have a nagging shoulder injury that you can’t quite kick? Here, yoga teacher Benjamin Sears demonstrates practical exercises to better understand your shoulders, optimize the way they function, and both prevent and heal shoulder injuries. In this 10-minute video, yoga teacher Benjamin Sears shares three game-changing wrist prehab and rehab techniques that will keep your wrists healthy and help to heal any existing pain. In these exercises, you’ll find concepts that can applied across many different postures and styles of yoga. Learn how to stretch and strengthen the muscles around your wrists so you protect this important joint when practicing weight bearing yoga poses. These exercises are scalable to any level of mobility, which makes them great to do before any practice that’ll require you to put weight on your hands. MANTRA: Spread love and kindness. A 1-on-1 with Benjamin Sears, where he unpacks the themes of adjustments and hands-on assists. "What do you get when you combine a yoga retreat with the French Riviera? A summer Francophile yogi dreams are made of. “People immediately drop a bit of shielding when they walk through the doors to panoramic views of the Côte d’Azur,” says LUXYOGA founder, Benjamin Sears, who is partnering with a range of yoga and wellness experts—from a doctor who can spot muscle imbalance to fellow YJ Influencer Erica Mather. First up on the roster, newly-added Yoga X BodyFit (June 21–27), which fuses traditional yoga with modern science. Hot Yoga Evolution(July 1–7) goes beyond the 26 postures by transcending effort into mindfulness. Those seeking to fine-tune their essence of positivity, might opt for Grace & Gratitude (July 11–17), a retreat that’s about “learning where to look.” For a more traditional selection, sign up for Vinyasa Yoga (July 22–28), an immersion-style retreat that pairs exceptionally well with Rosé and oysters." "Possibilities are endless when you arrive in the South of France for a LUXYOGA retreat. Depending on your price range, you can choose a simple room or a master suite overlooking the Riviera. Each retreat is led by two instructors, each of which have something unique to bring to the retreat. Imagine waking up to a day greeted by a warm vinyasa flow, followed by a refreshing and nourishing breakfast, an afternoon excursion or cooking class, finishing off with a relaxing dinner. Join our #YJInfluencers Benjamin Sears and Erica Mather as they co-lead the Grace and Gratitude Yoga Retreat in early July." Give this side bend a try to give you kidneys a little breathing room and your low back a little freedom. "Found! The Most Luxe Yoga Retreat in the World"
Relaxation practice for restful sleep. Be the first to find out about upcoming events, teacher trainings, and more!